We like Mercedes-AMG’s C63. It may have traded its glorious naturally aspirated V8 in 2015 for a smaller, turbocharged eight-cylinder motor but its hard-as-nails character and steely eyed focus on performance and driver thrills has endeared the line-up to us all at evo. It’s quite the line-up, too. Four body styles (coupe, saloon, estate and cabriolet), two states of tune for the hot-vee 4.0-litre and rear-wheel drive throughout. 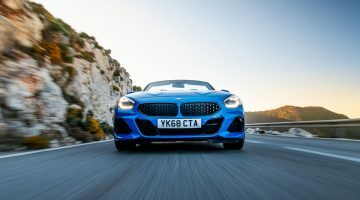 So while contemporary rivals from Audi Sport and BMW M have one or two options for you (estate, coupe and forthcoming 4-door coupe from Audi or saloon, coupe and convertible from BMW) neither delivers a full quartet and only BMW overs different levels of performance through its Competition Pack and limited run CSmodels. As with the rest of the C-class line-up, the C63 range has emerged from its mid-season refresh with all four body styles and both engines still offered. Is there a performance engine used in more applications than AMG’s hot-vee 4.0-litre V8? I ran out of digits at 20 models you’ll find the twin-turbocharged engine fitted to. 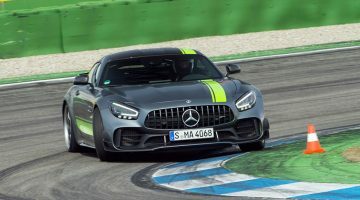 This includes anything from a two-seater Nürburgring lap record menace (the GT R), a five-metre plus long limo (S63), roadsters, coupes, saloon and estates, seven-seat SUVs and, of course, the new G wagen. In this revised C63 line-up it remains unchanged from its previous application, with two power and torque outputs depending on whether you go for the normal or S model. The lower powered unit develops 469hp at 5500-6250rpm and 479lb ft of torque from 1750 through to 4500rpm. Go for the S and power increases to 503bhp between 5500 and 6250rpm with torque escalating to 516lb ft from 2000 to 4500rpm. Regardless of engine tune, all C63 models are fitted with the latest nine-speed AMG Speedshift MCT auto replacing the previous seven-speed unit. With a wet-clutch instead of the torque converter, not only is it lighter but the nine-speed unit also benefits from quicker response times under acceleration. In manual mode you can blissfully hit the engine’s limiter with the ‘box refusing to change up until you’ve flicked the right-hand paddle. And an electronic limited-slip diff is fitted to all models, regardless of engine output. The quickest of the refreshed C63 range is the 63 S Coupe, reaching 100kph in 3.9 seconds and limited to 289kph. Its 469hp brother requires an additional tenth to reach the sprint benchmark and is restricted to 249kph. The S Estate and Cabriolet models are a tenth quicker to 62 than the non-S variants at 4.1 seconds, with S models of both topping out at 278kph compared to 249kph for the non-S. Opt for the saloon and you’ll wait 4.0 and 4.1 seconds respectively to reach 100kph and hit the limiter at 289kph and 249kph respectively. Are you sitting comfortably, warm/cold brew in hand depending on your time zone? Good, then we’ll begin with the revised C63’s range of technical wizardry. We’ll start with the AMG Dynamic Select drive functions. There are six in total, five pre-programmed: Slippery, Comfort, Sport, Sport +, Race (for the C63 S models only) and Individual, the latter lets you select your desired engine, gearbox, damping and exhaust setting. It doesn’t stop there, because both engine derivatives are also available with AMG Dynamics. A new piece of tech, it works with the ESP system (more of that later) to allow more measured and precise distribution of torque to the rear axle. An automated system, AMG claims it will react more quickly to a situation (which it has calculated) than the driver can. Naturally there is more than one setting for AMG Dynamics, too. Basic is for when you are in Slippery or Comfort mode. Advanced is activated when you select Sport and lowers the steering angle and yaw damping, allowing for the steering to be more responsive. Pro is connected to Sport +, sharpens the steering further still and claims to provide the driver with more assistance. Then there is Master, linked to the Race mode it allows a slip of oversteer and livens up the steering even further. To use Master you also need to slacken-off the ESP to ESP Sport mode or turn it off completely. Next it’s AMG Traction Control. Introduced with the AMG GT R, this nine-stage system is only available on C63 S models. With ESP switched off the scale ranges from Level 1 for wet conditions and a high safety net all the way to Level 9 to allow the rear axle and standard electronic diff to dance around until its Michelin Super Sports have had enough. There’s more, too. AMG Ride Control is standard and combines steel springs with adaptive dampers that can be configured as thus: Comfort, Sport and Sport+. And finally (stop cheering at the back), C63 S models get dynamic engine mounts as standard. Inside the changes are little less comprehensive. There’s a new 12.3-inch digital display for the instrument cluster and a 10.5-inch display for the infotainment system which includes access to AMG Track Pace – an on board data logger for you frustrated Lewis Hamiltons. There’s also a new AMG steering wheel featuring the touchpad controls first seen on an S Class. Like a C63 S that’s been through a very thorough once-over and freshen up. We only drove the S models on the car’s international launch in coupe, saloon and estate form and, to a model, each one portrayed those C63 traits so many have come to admire. The V8 still delivers above and beyond both Audi’s and BMW’s six-cylinder alternatives, benefitting from its inherent grunt advantage as well as throttle response and a willingness to rev that its rivals can’t match. Only the naturally aspirated V8 that Lexus wedges into its RC F coupe is ahead in the throttle response stakes. A noticeable improvement is the new nine-speed MCT Speedshft gearbox. 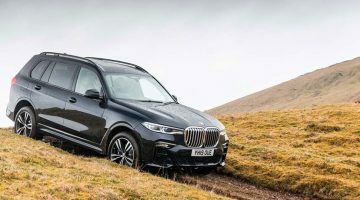 Not only are the shifts sharper and quicker, they feel better suited to the engine’s characteristics when you’re on an exciting stretch of road that only calls for third and fourth, with a bit of fifth gear thrown in once in a while. Downshifts on track can be a little slower than you want if you are selecting the gears via the steering wheel mounted paddles, and at times on the Bilster Berg track leaving the ‘box in auto provided cleaner, quicker downshifts under heavy braking. As for those multiple new driver modes? There’s too many for six short laps of Bilster Berg and half a day criss-crossing a small fraction of Germany’s countryside to experience all of them. They certainly don’t harm the dynamics. In fact, the C63 S Estate we spent most of our time in felt considerably sharper, more responsive and oh so secure compared to previous examples we have driven. Then again, we need to throw the regional road caveat in at this stage because our northern Germany test route, while superb for showcasing the C63S’s many talents at dismantling a series of corners and swallowing straights, was super smooth. I’ve used ironing boards with more ripples across their surfaces. Off the back of this drive, however, the C63 S appears to have lost none of its ability, charm or appeal, rather it appears to have added another layer of polish to its armoury. With prices yet to be confirmed by Mercedes, AMG C63 ownership starts in the region of $87,500 for a saloon and $99,000 for an S. A Coupe S will set you back in the region of $102,000 and a C63 S Estate is expected to cost $100,500. Rivals come thick and fast from the Munich area. Audi’s new RS4 Avant costs $81,830, its RS5 coupe retailing at $83,650 and don’t forget Audi will also add the RS5 Sportback later this year, a body style AMG only offers as an SUV in the guise of the $91,275 GLC 63, or $103,820 for the GLC 63S. BMW has three body styles to rival AMG’s four: the $78,900 M3 saloon and $79,500 M4 coupe and cabriolet. Unlike Audi, BMW M also offers a few performance options: standard, Competition Pack models and CS, although not for the M4 Cabriolet. Leaving Germany for a moment, there is also Lexus’s rather splendid $80,640 RC F coupe, a leftfield choice but one with the most charismatic engine of the lot and an unexpectedly sweet chassis, too. Previous ArticleImpound, 23 points and 2,000 Dhs fine if caught doing the “Kiki challenge”.